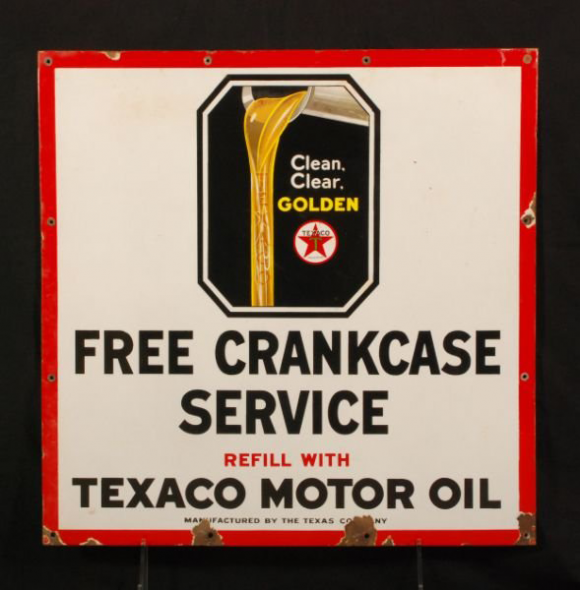 This is a square Texaco Free Crankcase Service porcelain sign. This particular Texaco Free Crankcase Service sign is white with black and red text. It reads, “Clean. Clear. Golden Texaco, Free Crankcase Service, Refill With Texaco Motor Oil, Manufactured By The Texas Company” and features a stream of yellow Texaco Motor Oil at the top of the sign.